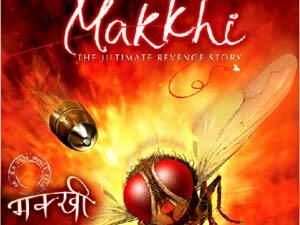 Makkhi is the Hindi dubbed version of the Telugu superhit Eega. It is the story of Jani and Bindu who are in love, but they never communicated their feelings to each other and continue to enjoy their unexpressed love. Sudeep, a billionaire and a powerful businessman gets attracted to Bindu and wants to own her for his pleasure, but he realizes that she is in love with Jani, which upsets him. When Bindu wants to express her love to Jani, Sudeep murders him. Jani is reborn as the fly and attempts to fight Sudeep`s advances towards Bindu, but his efforts go in vain. The fly convinces Bindu that he is Jani and they team up to take revenge.